This past Tuesday, Alan Gilbert, the conductor of the New York Philharmonic made history, but not for something you would expect. Conductors almost never interrupt a performance, other than for truly exceptional circumstances. Gilbert not only stopped the performance, he did something even more. Towards the end of the Philharmonic’s performance of Mahler’s Ninth Symphony, someone’s cell phone began to ring, and ring, and ring…endlessly. Before every performance in that hall, a recorded voice reminds people to turn their cell phones off, but apparently at least one patron had forgotten. The conductor didn’t just pause the performance – he turned towards the corner of Avery Fisher Music Hall where the sound was coming from and, with the help of the audience, narrowed down the possible violators until he identified the perpetrator. He then stared him down for what felt like a significant amount of time and refused to continue with the Symphony until the individual verbally acknowledged that his phone was now off and wouldn’t interrupt again. As I read this story, I was actually moved by the intolerance of the conductor and his protest against someone’s callousness and lack of courtesy that compromised his spirituality. Indeed, contrast what happened at the New York Philharmonic and what happens almost daily in Shul. 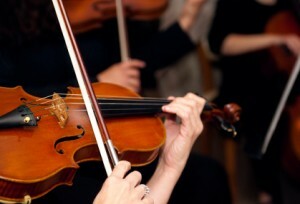 Three times a day we gather for a symphony, not of classical music, but of prayer. When davening, we are to get lost in a very far away spiritual place such that the sound of a ringing cell phone would rudely awaken us and bring us back down to earth. And yet, sadly, most of us are unfazed and frankly unbothered when a cell phone goes off. In fact, if anything, for many the ring serves as an alarm to interrupt our day dreaming and bring us back to the fact that we are actually in the middle of davening. After interrupting the performance, the conductor apologized to the audience for stopping, saying that usually it’s best just to ignore such a disruption, but this case had simply crossed the line. The audience cheered and applauded, clearly showing support for his intolerance of such a rude disruption. When a cell phone goes off in shul and nobody says anything, it is not only sanctioning the perpetrator, but of the rest of the minyan as well. If our davening means to us what Mahler’s Ninth Symphony means to Conductor Alan Gilbert, we must not remain indifferent and ignore such rude interruptions. Let’s together, with great sensitivity, create an environment that does not tolerate talking or cell phones ringing during davening and, through a sense of reverence and serenity, find ourselves “in a far away spiritual place” in the siddur. Rabbi Efrem Goldberg is the Senior Rabbi of the Boca Raton Synagogue (BRS) in Boca Raton, Florida. He serves as Co-Chair of the Orthodox Rabbinical Board’s Va’ad Ha’Kashrus, as Director of the Rabbinical Council of America’s South Florida Regional Beis Din for Conversion, and as Posek of the Boca Raton Mikvah.